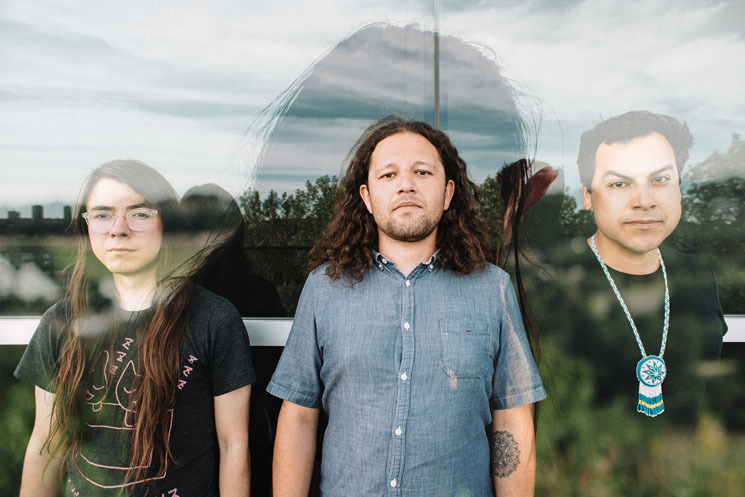 nêhiyawak — Marek Tyler, Kris Harper, and Matthew Cardinal — sit in a parked car in the River Valley of amiskwaciy (Edmonton) and carefully consider their band's distinctive rock sound and impactful songwriting. Their debut EP, starlight, closes an incredible year for Indigenous artists that included Jeremy Dutcher's album Wolastoqiyik Lintuwakonawa winning the 2018 Polaris Music Prize. Upon his win, Dutcher concisely summarized this surge of Indigenous artistry when he proclaimed: "Canada, you are in the midst of an Indigenous renaissance." "What we've been listening to or taking in for the most part was a very male-dominated, Euro-centric view or perspective. Because there are now outlets for the quote-unquote 'other,' from the bigger picture rhetoric, those 'others' are able to have voices now and those perspectives and those abilities to use the same format for art is really being born," Harper tells Exclaim! "We're just a part of it. There's a lot going on not only in Canada, but globally." Tyler and Harper are cousins who first made music together in the early 2000s. After living in different cities for about a decade, they reconnected at a family gathering and decided to jam together again. "Right away, something felt unique and distinct about it," Tyler says regarding their return to songwriting. Harper invited his friend Matthew Cardinal to join them and together the trio started developing songs. nêhiyawak went into the studio with Colin Stewart (New Pornographers, Black Mountain, Destroyer) and independently released a three-track EP in 2017. They later signed with Arts & Crafts and put together a new collection of tracks, starlight, in anticipation of a forthcoming full-length release. starlight is a thunderous EP of, to use the band's descriptor, "moccasingaze." Harper's angular guitar is woven into Cardinal's bass and woozy synth work, which is all anchored by Tyler's resounding drum beats. Together it makes for an enveloping and unique soundscape. "I'm not trying to emulate any kind of music per se. And I don't think any of us are," says Harper. "I think that's part of the expression of the language that is being created in a lot of Indigenous artists' work." "I remember when we first started playing, I asked Kris what a song was about and for me, the approach on the drums, was to think about how to evoke that feeling," says Tyler. "I love the fact that when we first rehearsed, Kris said that the songs were young." "Yeah, I didn't want to hold anyone to how it was meant to sound," responds Harper. "I wanted everyone to bring their own part to it." "With Kris's leadership that way, it became much more free," Tyler adds. "It became unique and distinct for me, because I could do whatever I wanted. I felt a lot more proud about being able to bring that to the table." In their five-track outing, the content of nêhiyawak's songs is expansive and interconnected. Their EP's title is a reference to the starlight tours — a series of Indigenous peoples' deaths in Saskatoon at the hands of police — and on "page" (featuring poet Marilyn Dumont) the trio remark on the power of historical documents and their continual impact on Indigenous people. "copper" centres on cultural connection, "somnambulist," is about extraction industries, and the closing track, "open window," references the "Sixties Scoop" and the residential school system. nêhiyawak look back and look forward on their EP. They see themselves and their music as a part of larger ongoing discussions about reclamation and justice and hope others will engage in these conversations too. "We did a soundtrack [for the documentary ôtênaw] and in that, [educator] Dwayne Donald speaks about the layers of history in the River Valley in Edmonton. The River Valley that we are all parked in right now, actually," says Tyler. "He talked about those layers of history and how they're all relevant all the time. And I really enjoyed that perspective. There's teachings and lessons that have been passed down and I think about the decisions that I make today, or try to, that will impact what will happen in a year or in the next generation. Is there a sense of that happening [in starlight]? All the time. We're living it, we're standing on it right now in the Valley. It's not lost on us where we are right now and it's not lost on us that we were here, we are here, and we will always be here." starlight is out now on Arts & Crafts.